Holiday.gr - Kalo livadi, a trip to a myth! From Ano Mera you can easily reach the beach of Kalo Livadi. 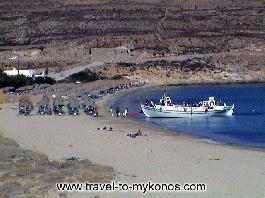 It is 2km from the village and 10km from the center of Mykonos. It is ideal for everyone wanting to relax away from the cosmopolitan and noisy beaches. There is a hotel and a tavern near the beach. Been to Kalo livadi ? Share your experiences!